I would be perfectly happy if we could go straight from spring to fall. Like, let's have spring through July and fall starting in August, and just skip all this silly hot weather. And yet somehow all the fruit could magically get ripe anyway even if it never went over 80 degrees? Sigh. I HATE the heat. It was 107 today. Even the cats melted. As everyone likes to say here, "at least it's a dry heat" and having recently been to the part of the country where I stepped out of the gloriously air-conditioned 75 degree car long enough to gasp the moist 90-something degrees air and say "eww" I agree, thank goodness it's not humid here. I don't ever in a million years want to live in a hot and humid climate. I finished the first lion knife tonight (the one I showed in progress last time). I will attempt to shoot some good pics when both are done, so I think I'll just leave you in suspense until then. I'll start the second one tomorrow. It'll be in color. I'm with you regarding hot and humid! But 107 degrees??? That's just plain horrible. Was it really 107? It seemed a little toasty, but I was outside a lot and it wasn't bad. 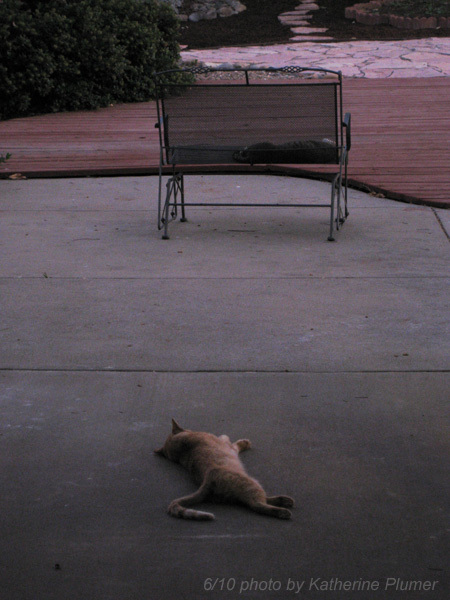 My cats were sprawled all day, too, but there's nothing unusual about that. They're the laziest critters in the world. The lizards seemed happy yesterday. Okay, I live in hot and humid, but the terrible part is that I seem to be getting used to it. Kinda like I was in AL. Yucky hot nonetheless. -BMc. You know, to me, anything over 90 feels just plain HOT, too hot to be out and too hot to do anything productive. Even J asked how I could have survived in this valley for all these years...I get crumpy when it's hot, especially when it doesn't cool off at night. I could have died the other night - J's mom didn't have the ac on, and I couldn't sleep a wink. Why is it that old people refuse to allow other people to be comfortable? Why is it that they keep the house at 85 degrees and they are just fine (while the rest of us sweat), even in the middle of winter? I guess this explains why so many go to Florida, LOL. Even my grandpa is the same way...I have to convince him to use the ac, and it's rather ridiculous that he wonders why no one wants to visit in the summer! Note to self - when I am old, I will care about other people's comfort and keep the ac on, even if I need to wear a sweater! LOL.